Let's Do It for ME! : Last minute presents? …….Teds and Tugs! How can you resist this cutesy little bear? 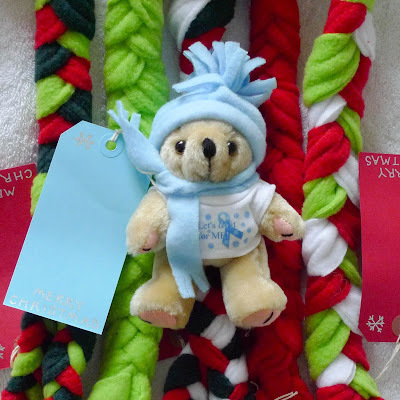 Perfect as a stocking filler or even as a treat for yourself, each bear comes complete with its very own ‘Let’s do it for ME’ snowflake T shirt and handmade fleece scarf and hat in baby blue. Their legs and arms are jointed so they can stand (5” high), sit and even wave! Bears cost just £3.50 each. Or perhaps something for your canine friend? Handmade tug toys! 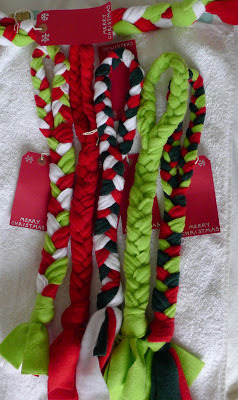 The tugs are made from fleece (gentle on dogs' mouths and stretchy) and are machine washable. Each has a handle for pet owners to hold to get a better grip. They measure around 22" slack and 29" when stretched. Although called tug toys they’re great for wiggle and chase. They can even be used as part of agility training - and at £2.00 each they’re a snip! Every bear and tug comes with a Christmas greeting label. Up to 2 items £2.90 1st class or £2.40 2nd class; up to 4 items £3.00 1st class or £2.50 2nd class. To place an order please contact Annabel Luery either by email annabel.luery@tiscali.co.uk or message her on Facebook. Payment by PayPal preferred. But hurry – only limited stock available! All profits from the sale of these items will go towards the ‘Let’s do it for ME’ £100K campaign target (see leaflet for more details).